Hundreds of American women have kept the lamps burning in lighthouses since Hannah Thomas tended Gurnet Point Light in Plymouth, Massachusetts, while her husband was away fighting in the War for Independence. 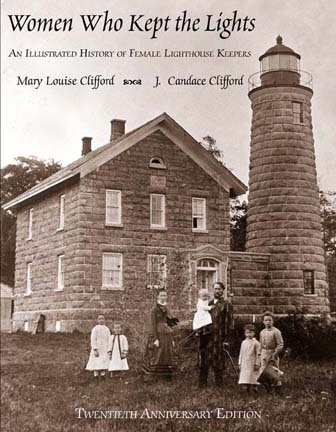 Women Who Kept the Lights details the careers of 34 intrepid women who were official keepers of light stations on the Atlantic, Gulf, and Pacific Coasts, on Lake Champlain and the Great Lakes, staying at their posts for periods ranging from a few years to half a century. Most of these women served in the 19th century, when the keeper lit a number of lamps in the tower at dusk, replenished their fuel or replaced them at midnight, and every morning polished the lamps and lanterns to keep their lights shining brightly. Several of these stalwart women were commended for their courage in remaining at their posts through severe storms and hurricanes. A few went to the rescue of seamen when ships capsized or were wrecked. Their varied stories are brought together in this popular title, drawing a multifaceted picture of a unique profession in our maritime history.